I've been furiously working on a few things...mostly earrings...to take with me to Tucson. I'll be teaching at Art Retreat in the Desert (not too late to register!) but the first big happening is Thursday evening, Feb. 4th at 6:00 pm. I'll be participating in the Vivi Magoo Marketplace. I'm pretty thrilled with this new Archway earring design and will, hopefully, have a couple of pair of these at the Marketplace. I'll have several other pair of gem stone laden earrings, as well. It feels good to get back to the bench, after a pretty long absence! I'm turning loose some of my worked metal pieces (so work intensive, but so pretty!) and even some of my older, favorite pieces. These are pieces that have been in my personal collection for a long time because I just couldn't let them go. But, now it's time. I feel a change coming and I'm ready to clear some things out! This one is a class sample from my new Chain Reaction class. Don't you love that tourmaline crystal? I'm hoping to find more of this type of material at the gem shows. Can't wait to get shopping, in just a few days. See you there! You guys asked for it so, here it is...Sublime Design! 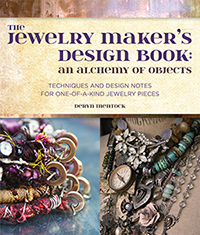 I'm so excited to teach this as jewelry design is one of my favorite subjects. We'll be working our way through all of the design elements and principles you'll need to create beautiful pieces. We'll be doing some sketching and there will be lots of instruction on color theory; something a lot of jewelry peeps don't think about. The construction techniques I will offer will be based on the projects you, the students, want to work on. If you're struggling with design, or color, this is the class you need. The other brand new class I'll teach is called Chain Reaction. We're going to be working on some beautiful and unique chain. Ever want to make soldered chain but were intimidated? I'll show you how to do a lovely, twisted soldered chain. This one is really versatile. We're also going to do a intricate looking herringbone weave, as well as a basic wire wrapped bead link. The last one is a one-of-a-kind copper chain that includes my very special hand-formed disks, combined with a heavily wrapped wire link. This chain is a variation on a ball and stick style chain and is so much fun to make! If you've never been to a Vivi Magoo event, like Art Retreat in the Desert...or you've never been to Tucson, believe me, now is the time to go! This event is run in conjunction with the Tucson gem shows. You can find every kind of gem, bead, stone, fossil, cabochon and what-not, at these gem shows. It's gem heaven! Ok...so, it's not too late to register. I hope ya'll can come! Another Christmas has come and gone and today is Epiphany day. Traditionally, this is the day the church celebrates the visitation of the three wise men to the Christ child. This day is also called Three Kings Day or Twelfth Day, as today marks the twelfth, and final, day of Christmas. What better way to celebrate than to wrap up my Christmas ornament blog hop party? Because there were only six participants (wow...only six of you?!!!) I'm going to double up on the prizes so that you each get something. The catch is that you have to contact me as I may not be able to contact some of you. Either email me or comment here, on this post if you participated in the ornament party...you know who you are! I've got two spots in my next online class...two copies of my book and two Something Sublime t-shirts. Yay! My sincere hope is that ya'll had a very merry Christmas and you're looking forward to a creative and positive new year. Thank you SO much, those of you who played with me!